Open Google Chrome browser, and on the right top, click on the Wrench icon where you see the dropdown list. Click on Options, and it will open the various option sections in form of a tab page. In the Options tab, the left side would have 3 sections. You need to click on "Under the Hood" to open the options that change mostly the interface and the internal stuff of the Chrome browser. In the Under the Hood options, you would see the "Language and spell-checker settings..." option under "Web Content" section. 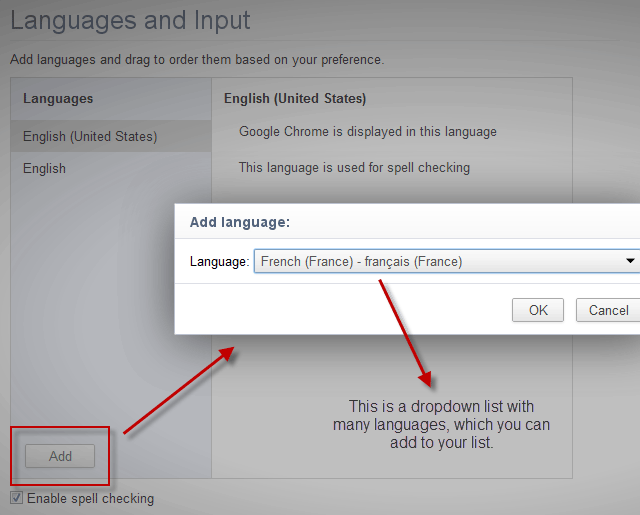 This is where you can enable the spell checker and also, change the language of the Chrome browser. Click on that and a pop-up box with the set language appears. In the box, the left bottom side would have an "Add" button where you will see the list of languages available for the Google chrome browser. Select the language you want to have as a default one for the future. For example, we added the French language and it gets added to the list, and there would be 2 languages - One having the spell checker enabled. Once you have added the language, you can select that language and choose "Display Google Chrome in this language" and that language would be set as the default one. You would need to close all the windows of Google chrome and restart the browser to see the changes. As we changed the preferred language to French, the options menu in the Chrome browser now looks like this. There are several languages you can change to, from the default English one but not each of them would have the Spell check option. The tutorial is pretty easy and has just a few steps for you to do, and the same steps can be followed to go back to the English language if you didn’t understand the set language easily. Next article: How to get Google+ invitation for free?